My job as Headmasters Colour Ambassador is to spot trends and formulate techniques and concepts based on these trends. The most obvious place to spot these trends would be to head to the latest runway collections. Over the last few years there has been a common denominator which has been long and natural looking hair. However for the last few seasons there have been huge changes. Models are no longer being booked to look similar but for their individuality which is really exciting. It has opened doors to creative colour and more individualism. I’m not saying everyone now is going to shave their hair off and dye it rainbow colours but it will definitely encourage change and at the very least plant the idea of change. I've spotted 3 key trends that can easily be adapted and altered to be made individual for everyone. The colour red will be leading the way this AW not only all over the style circuit it is the leading colour(flame scarlet ) as predicted by Pantone who are the leading predictors of colour within design, fashion and creative industries. Models such as Katherine Moore and actress Lily Collins have also been seen sporting it. This red is fiery but remains expensive looking with an underlying cool tone which softens it and keeps it looking wearable. Understandably red is not for everyone but why not try a nod to the trend and ask for mahogany which is a brunette shade with underlying tones of red - perfect for winter! Colour melting is a technique which blends and merges one colour into another. It has become increasingly popular as it's a technique that can be made as bold or as soft as you want. Die hard highlight lady's can now opt for a colour melt technique which will maintain the blondes throughout the ends but add a more natural tone throughout their roots and brunettes can work their natural colour on the root but melt an alternative tone throughout the ends. This will draw attention to the blonde or tones on the ends whilst keeping it low maintenance and look after the condition of the hair. If you wanted to sport a bolder version of this you could opt for pastels or a variation of copper and red tones (just an idea). This technique works best on long lengths as the longer the length the more you can see the different tones that are graduated. It was a trend that we thought was only a fad but it seems it's here to stay. What’s great is that it's given blondes or those with blonde colour in their hair a chance to have fun with their colour without the commitment. Often in winter, blonde clients feel they have to darken their hair but that does not need to be the case. Yes the season has changed and we are wearing different shades but it doesn't necessarily mean going darker is the answer. 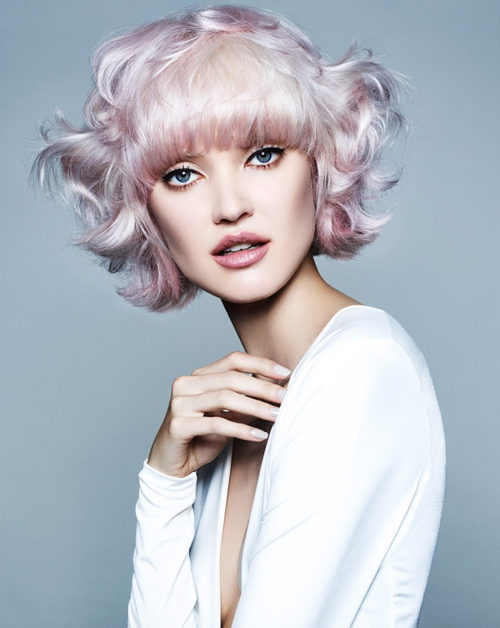 Opt for changing the tone of your blonde with hues of rose gold, lavender or blushed pink. These tones are great for blondes as they will easily fade out of the hair leaving you with option to enjoy your blonde or change your tone next time. 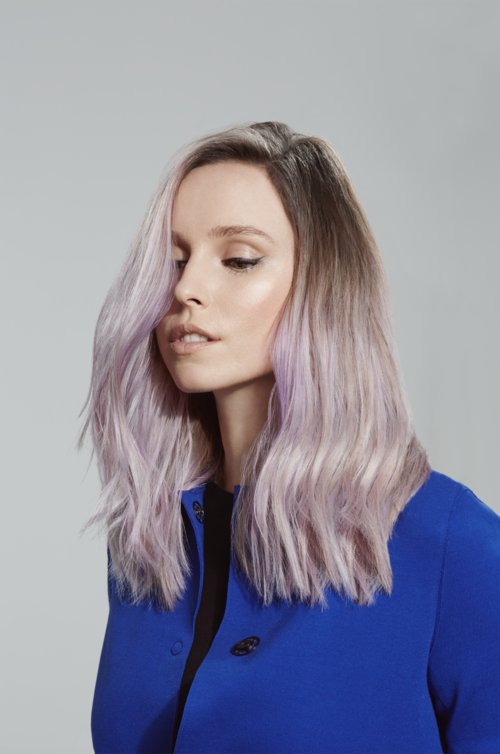 You can also alter the shade of your pastel to really compliment your skin tone, makeup and clothes by asking your colourist to adjust your bespoke colour mix with cool tone, warm tones or clear which can soften and pastelise the end effect. 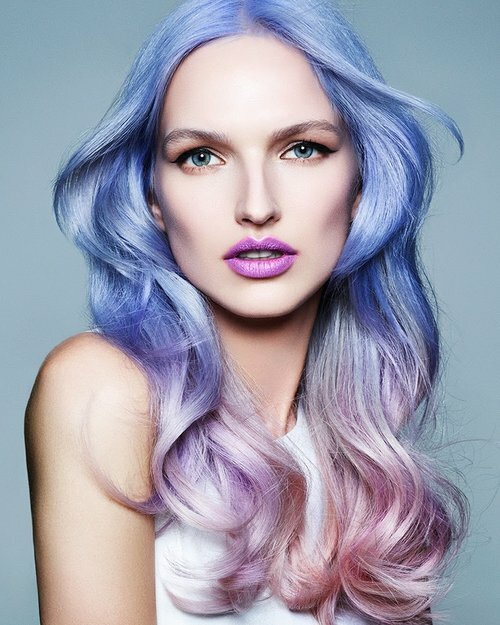 Colour Courageous – You are up for anything; you love changing up your look and get excited about new colour trends. Colour Confidence – You know what suits you and just want to make the most of it. Because the lift is so bright and light you need to make sure it suits the wearer . When lifting ,hair will often lift from red -orange -and Orange -yellow and yellow to pale yellow for the lightest result . Before you put your grey tone on you need to remove that yellow shade to ensure the greeny blue thing doesn't happen . + 1-4 cm of your black tone (the more black you add the darker your grey will be )and then you can add any additional tone to adjust your end result. All hair is different so bare in mind mixing ratios are there as a guideline . Always do a test strand before going straight into colouring the whole head . For me to get the perfect result on Jade I worked different mixes on different strands of the hair . Where her hair was most sensitised it grabbed quicker so I opted for less base 1 with my mix . Elsewhere I was able to go a bit heavier with the black in my mixture . Jesy has a medium skin tone so she can pull off lots of different looks. Early last year I used A Summer Lites technique, placing lighter ribbons of colour around her face to illuminate her cheekbones and eyes. It is chic and expensive-looking colour which is surprisingly low-maintenance. Then I went for a look with more drama and definition; blending a rich brunette base with the Tissue Lites technique. This is great if you want a highlighted effect without looking stripy or false, and also gives the impression of volume. Towards the end of last year, I went seasonal and did a Winter Red; a bespoke, gorgeous red tailored to Jesy’s skin and eyes. I used different tones and balayaged the colour through to create a rich, glossy red, and used semi-permanent colour to keep it ultra-nourishing and kind to the hair. The secret is to keep the tones around Jesy’s face soft and subtle, with more depth towards the back; the dark shade she is sporting at the moment has hints of mahogany, which softens the colour and makes it easier to wear.